It seems that Anonymous has begun to understand that to change the world they may have to play within the rules somewhat. In the panel discussion at Defcon, we discussed how Anonymous should channel their efforts to have greater effect without all the blowback and collateral damage that they had been creating with their antics. This week Anonymous came up with a new splinter org that claims to be an analysis wing looking into corporate wrongdoing. 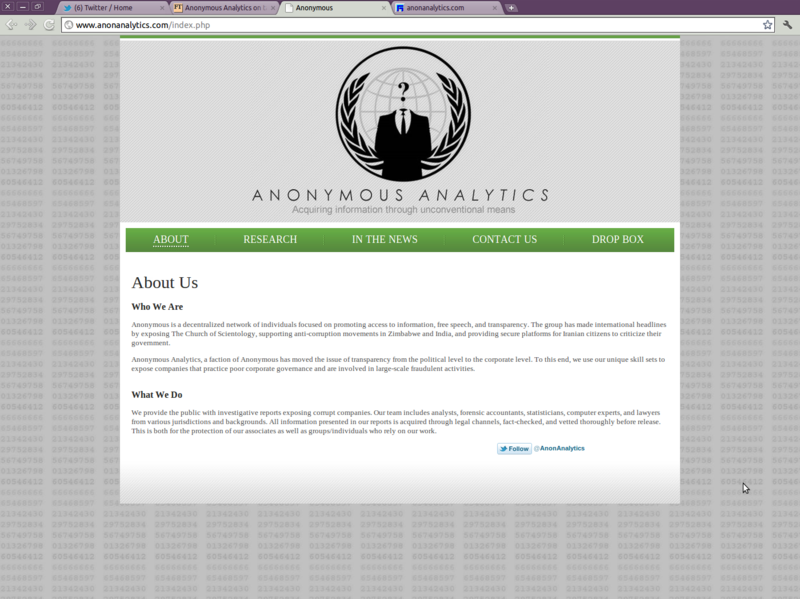 This group is called Anonymous Analytics and claims that they are using open source information as well as soliciting leaks/whistleblowers to provide them with data to show corporate malfeasance. The claim has been made that the idea came from the “OpOccupyWallStreet and OpEmpireStateRebellion” by the new group and that the take away was that if you directly affect the stock price of a company you get quick attention and potentially, corrections in behavior. At the very least I would say, is that this would cause waves either way. The problem is yet again, verification of actual malfeasance or corruption. When asked by the Financial Times, if the anon’s involved had CFA qualifications, the Anonymous representative said “That’s entirely possible. Our backgrounds vary, but it’s not something we discuss” Which is really just a way of saying “no” So, once again we have the greater potential for more dumps of data from Anonymous that turns out to be nothing to write home about and is not verified in any way. This will ultimately fail as the other efforts have failed to make a change unless they do get bone fide people with credentials to verify the data that they claim to have AND it can be proven that the data is not manufactured. Both of these things are hard and more likely to happen if they actually get someone from the inside to give them the data. Like another organization we all know, Wikileaks. So, to their credit, Anon Analytics did set up a dead drop of sorts (at time of writing here, it was not working) as well as a Hushmail acct was offered as a means of contact for encrypted and secure communications. So, the intent is there to gather the data from sources instead of just hacking into places and taking whatever they can get their hands on and puking it out on the internet. Now to the bad… While I appreciate the effort they are making, they have to have the following things in place to have a real affect. This is pretty much the kind of thing we were talking about at Defcon, but, it has to be done right or nothing good will come of it. I laud your intention, now tighten it up and show us you can do something productive. The post doesn’t seem to be displaying correctly. Good informative post. Something very interesting to me here. Thanks. It’s actually a great and helpful piece of info. I am happy that you shared this useful information with us.